Prince George, B.C. 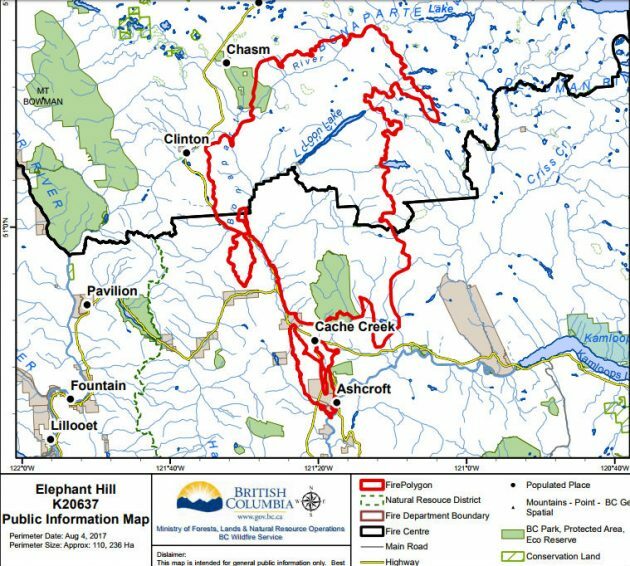 – Despite the best efforts of the BC Wildfire Service, the Elephant Hill fire north of Cache Creek continues to grow. Chief fire information officer Kevin Skrepnek says the massive blaze has grown to 110,000 hectares in size and remains just 30 per cent contained. “It was another day of aggressive fire behaviour yesterday, especially on the southwest of the fire,” he says. While success on the fire remains elusive, he notes it remains their top target province-wide. Provincially he says there are 125 fires burning – sixteen of which started yesterday. Since the season started April 1 Skrepnek says wildfires have burned 588,000 hectares of forest at a cost of $219.6 million. As for the weather, he expects the hot and dry conditions will persist in most parts of southern B.C. while winds should remain light today and tomorrow. Skrepnek adds the slight threat of lightning will increase tomorrow into next week “almost guaranteeing” new fire starts. A glimmer of hope however as he said the long-term forecast – Aug. 12 to 13 – could bring showers and some cooler temperatures though he’s not overly optimistic because it’s so far away.